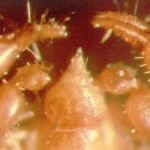 The cephalothorax and pedipalps are red-brown; the opisthosoma olive-green and glossy; length of body: 1.5–1.7 mm. Europe: Denmark and England. The distribution of this species in Britain appears to be sparse, ranging from northern and southern England, central Wales and Ireland. It is likely that it is more common than it would first appear. Lamprochernes savignyi is a cosmopolitan synanthropic species found in compost and manure heaps, plant beds (e. g. Kew Gardens) and it is commonly phoretic on flies. 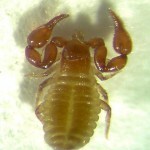 For further information see Mark Harvey, Pseudoscorpions of the World. Anterior end of a dry preserved specimen of Lamprochernes savignyi showing pedipalpal trochanter.